Another family name that used to prominently figure in Adams County that is now “extinct” in the county is Pemberton. That family first made Adams County its home in the mid 1790s in the presence of William Pemberton and his family. Dates in the historical records vary, but it is stated by some that the Pembertons settled in Franklin Township as early as 1796. The Pemberton’s pioneer home stood about three-quarters of a mile north of where the village of Locust Grove is now located. The two-story log house stood on the east side of Zane’s Trace (now, Ohio Route 41). William Pemberton was a native of Virginia and one record indicates he was born in Culpeper County in 1749. During the American Revolution he served as a private in the First Virginia State Regiment. He was present at the siege of Yorktown and witnessed the surrender of Cornwallis there. It is believed he died in Adams County sometime between 1817 and 1820 and was buried on his farm. His wife was Rhoda Luck, also a native of Virginia, who survived her husband until 1845. Shown here is the Pemberton log house built in 1796 by William Pemberton. The structure was torn down in 1912. 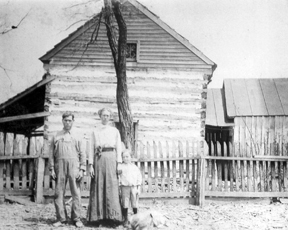 It is believed this photo was taken about 1876 of Silas H. Pemberton and his wife, Cynthia Williams, with their son, Harvey C. Pemberton, on the south side of the old home. Used courtesy of Mr. & Mrs. Lester Wallis of Hillsboro, Ohio. William and Rhoda’s log house was next occupied by their son, Fountain Pemberton. He was born in 1792 in Virginia and served in the War of 1812. His wife was Margaret Cannon. Fountain is remembered as one of the few residents of Adams County who captured runaway slaves to return them for the bounty on their heads. The family home stood on Zane’s Trace, known in the years immediately preceding the Civil War as the “Maysville-Zanesville Pike,” and was a well travelled route on the Underground Railroad, giving Fountain numerous opportunities to supplement his farm income. It was passed down through the Pemberton family that Fountain’s activities as a slave catcher were not liked by many of his neighbors and some of them made attempts to trick him into getting in trouble with the law to discourage his efforts as a bounty hunter. Fountain Pemberton lived to witness the nation’s Civil War that forever ended slavery in the United States. He passed away in 1874. Margaret had died in 1865. Their son, Silas Hubbard Pemberton, was born in 1828 in the family’s log house, growing to manhood there. Silas H. Pemberton became a blacksmith and operated a shop in nearby Locust Grove for over forty years while also continuing to farm the Pemberton lands. He was the third generation to occupy the old log house, making it his home until 1907. He was twice married, his first wife, Lovina Puckett, giving him three daughters, his second wife, Cynthia Williams, presenting him with two sons and a daughter. One of these sons was the celebrated Harvey C. Pemberton, a prolific writer and historian. Silas died in 1911.